Looking for the Best Tacos on the Las Vegas Strip? 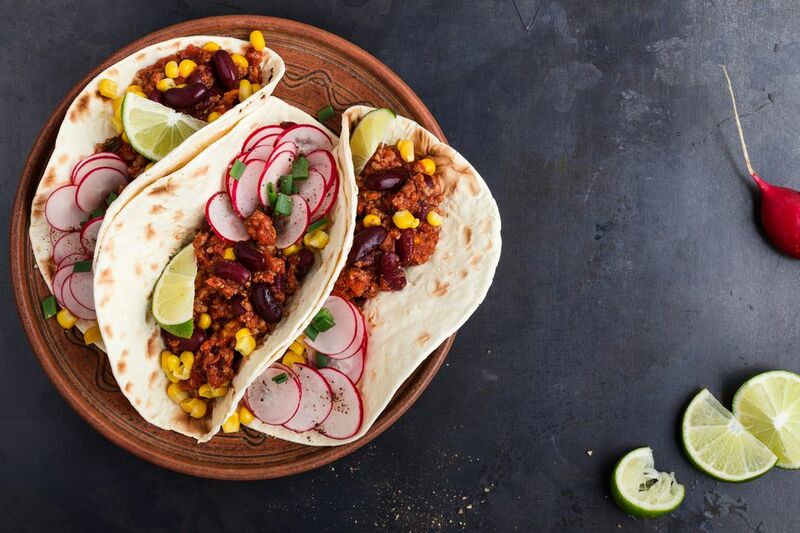 Tacos are as American as burgers and apple pie and because of that, you should always seek out the very best when traveling. Las Vegas is a food lovers town and you can bet that finding a good taco is not a challenge. Expect a bit more out of your taco experience in Las Vegas with bone marrow, braised veal cheek, potatoes even beef brains and tongue tucked away into a soft corn tortilla. From fancy to simple you'll find what you'll be looking for even on the Las Vegas strip. These are few places on the Las Vegas strip where you can get a quality taco but don't lose it when you don't see your favorite spot. Send in a suggestion if you have a favorite taco on the Las Vegas strip. They closed and then they came back! This is first on the list and it usually is quite good and it is easily the cheapest place to get a good meal on the strip. This is also the spot where you can get tongue, brain, pork, beef, chorizo and a long list of other very good ingredients that you will not normally find. Practice your Spanish because you might need all those words you forgot after 8th grade just to make sure they get your order correct. There is no alcohol hee so consider an aqua fresca. You are going to share La Tablita because you want to be able to make your own tacos right at your table. They bring you everything you need and you sit down and act like you have done this your entire life. I typically will make two before I start sampling. Be smart, eat fast. If you take too long you'll get full before you even make a dent. Extra guacamole, salsa and a sprinkle of rice is my favorite combination. Make sure to sample a Margarita while you are having your feast. The shrimp taco is pretty killer at Hussong's but I often think that the salsa is so good that I could eat cardboard in a tortilla here and still be satisfied. This is definitely one of those places where one beer, one taco and a lot chips and salsa make for a meal. That does not make me cheap, it makes me frugal. My suggestion is you order the bone marrow and make your tiny tacos with all the good stuff that comes out of that hole. All you need are the Charlie's Tacos with one giant Margarita and a seat on the back patio. That is as good as it can get. If you can fit it in you might as well get the ceviche and order a second drink. Guacamole is good here and people watching is at its best. These tacos are a little expensive yet you'll still go in and pay for them. They are that good. The langosta taco is why we love to eat. Every bit of flavor is packed into that beautiful thing and when you bite into it you instantly know you need to have another. The pork taco is similar and you'll try to jam one in your front pocket for snacking later on. The funky menu that combines Chinese food and Mexican food allows you to explore a different culture while snacking on some braised pork. The Ahi Tuna taco is what you'll have and you'll be forced to stop after your first order. Tangy, fresh and so super good. You might need a burger as well. Oh, the braised short rib lasagna is worth a try . Oh, wait, we are talking tacos. Sorry.